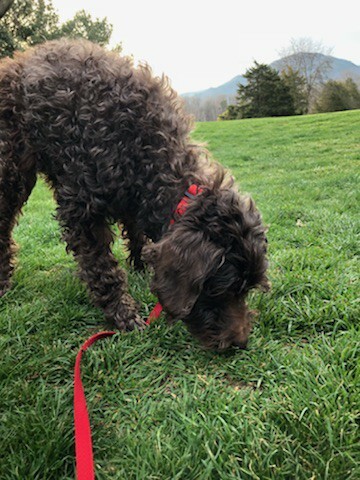 In late March 2018, a southwest Virginia shelter contacted the Blind Dog Rescue, to let BDRA know they had a sweet blind chocolate poodle with some medical issues. 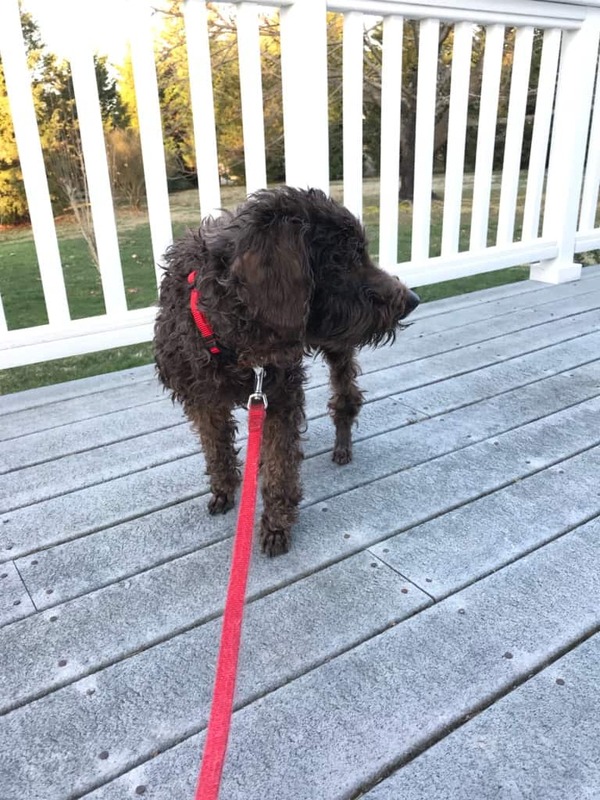 BDRA stepped up to take the poodle who was then named Starla, and Starla is now in her Virginia foster home getting her medical needs addressed. And getting lots of love and care too. When Starla arrived, she had some pretty bad teeth along with several large lumps that needed to be removed, so she has had a dental (13 teeth extracted!) and removal of three masses (all benign!). She still has some lumps and bumps, but these are quite small and aren’t of concern at this point. An endocrine test confirmed she has been spayed. She is heartworm negative. Her ears were cleaned and she has been on some medication to reduce the inflammation, and she should be finished with that soon. Her heart and lungs are strong, as is her body. No joint issues at this time, but she is underweight. She likes to eat though, so her foster home is helping her to gain a pound or two. She weighs 18 pounds, and the shelter guessed that she is about 10 years old; she was a stray, so they didn’t know for sure. Starla cannot hear or see, but don’t think for a minute that she does not enjoy things other dogs enjoy. She loves to walk around outside and smell the smells. She also loves a soft bed, a back rub, and treats. She also enjoys lap time! Starla’s right eye is very small and is sunken in the socket (phthisis bulbi). She gets ointment daily which keeps it clear. Her left eye has a mature cataract, lens luxation, dry eye, and glaucoma. She also gets ointment for this eye. She is on no other medication at this time. Starla sleeps through the night. And she does pretty well on the leash. She has a tendency to walk in a circle sometimes, and her foster mom has a theory that some blind dogs who like to move will find a safe circle, and then go round and round in order to burn off some energy. Starla can walk in a perfectly straight line when she wants to, and the vet confirmed she doesn’t think there is anything neurologically wrong with Starla. Starla lives with five other dogs – one is blind, and two of them are blind and deaf just like she is. She doesn’t mind any of the dogs, and will share a bed with them, too, if they would like. Even though she cannot see or hear, she does a good job of not running into them most of the time. She has not been around any cats or young children; regardless of the dog, though, young children need supervision when they spend time with any dog – and especially with a dog who cannot see or hear. Starla has never growled or snapped or tried to bite. She has been needing some ongoing medical care as she recovers from her dental and mass removal, and she has tolerated the vet visits and bandaging and wearing the cone remarkably well. She is housebroken for the most part, with some occasional accidents if her foster parents don’t take her out when she is ready to go. Starla is on medical hold at this time while she continues to recover from her surgery, and while BDRA considers the possibility of eye removal. However, soon Starla will be up for adoption, and she is hoping there is a just-right home out there for her. She is a sweet, special dog who deserves the very best! 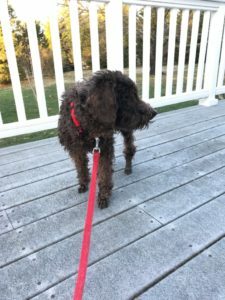 And, while Starla waits for her perfect forever home, she will be writing in her blog, and sharing her adventures in her foster home. Check the blog from time to time to see how Starla is getting along. Starla is forever in our hearts. Starla is looking for her forever home. If you think it could be yours, read more about Adopting from BDRA before submitting your application below. BDRA relies on your donations to rescue blind dogs around the United States. Please consider giving in support of Starla.